The Ocean Observatories Initiative (OOI) program this weekend successfully deployed moorings off the New England Coast, marking the first comprehensive test of an OOI system on the East Coast. The OOI team on the Research Vessel Oceanus on Sept. 22 deployed three test moorings at two sites on the continental slope south of Cape Cod. That shelf break is at 39° 55.0’ N, 70° 47.5’ W. At that location, two moorings — a surface mooring and a moored profiler — were placed at approximately 1710 feet (520 meters) water depth. A third mooring was placed at a deep ocean location at 39° 30.0’ N, 70° 47.5’ W. That mooring was placed at 8136 feet (2480 m). Two of the test moorings are for the Pioneer Array component of the OOI and another test mooring is designed to be used in the deep ocean global array part of the program. 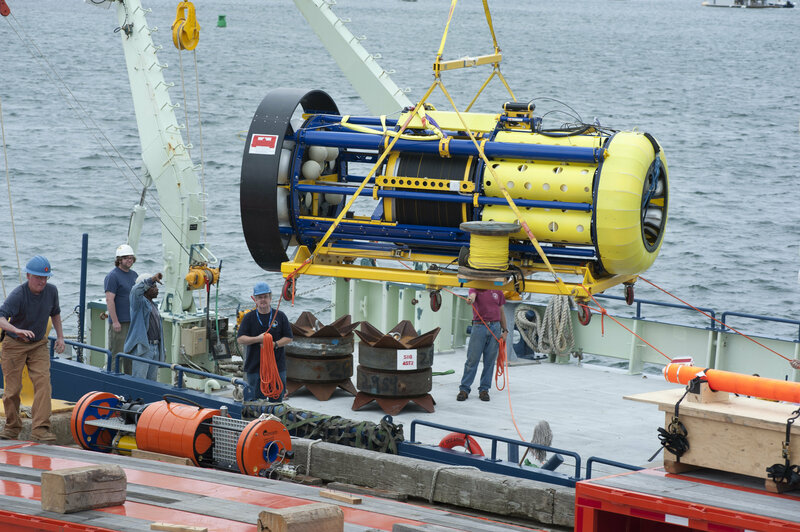 The OOI team at the Woods Hole Oceanographic Institution reported they are receiving test data from the deployed test equipment. The information gleaned from the Pioneer Array will include sea temperature, winds, wave height and currents. The Pioneer Array will contain: 10 moorings distributed among seven sites; three Autonomous Underwater Vehicles and six gliders. Though based on decades of experience, the OOI mooring designs are new and testing will allow the program to validate the designs of this important component of the program. Over the duration of its deployment Pioneer Array moorings are planned to be in place for approximately six months at a time before being replaced by refurbished moorings. The Pioneer Array test will include special instrumentation to allow examination of mooring performance during the deployment interval. 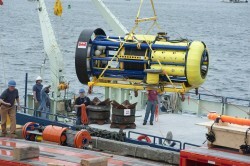 Under the test plan, the moorings will be in place for approximately seven months with a planned recovery in April 2012. After recovery, the OOI team will combine telemetered and recorded engineering data with observation and testing of mooring materials to evaluate performance. If necessary, the design will be fine-tuned prior to the Pioneer Array deployments. Components of the Endurance Array were tested during the summer off the Oregon Coast. In addition, the OOI program this summer installed the Undersea Cable off the Oregon and Washington coasts that will link scientists and others on land to data streaming from an extensive array of next-generation sensors located in the ocean and on the seafloor. Read more details on this At Sea Test here and continue to visit the OOI Website for additional test photos and video this week.